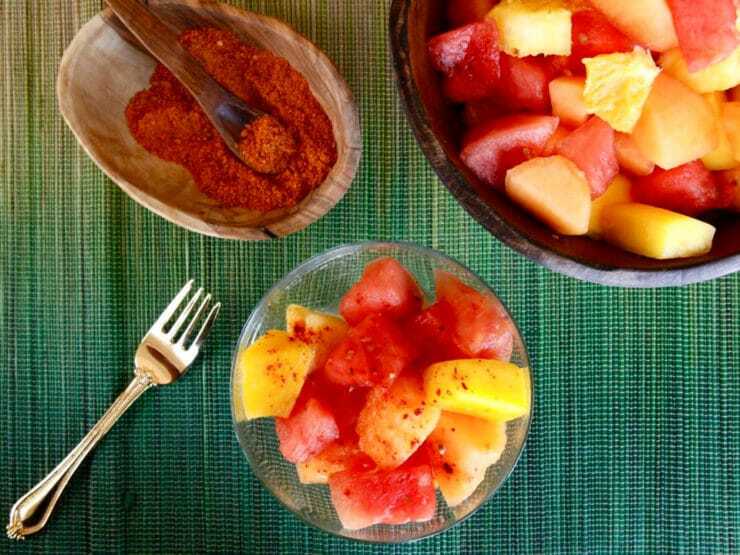 Ensalada de Frutas con Chile – A spicy Mexican fruit salad recipe with salt, lemon and chile de árbol. Cinco de Mayo or summer salad. My friend Sandra was born in Puebla, Mexico, the site of the famous Battle of Puebla commemorated on Cinco de Mayo. Every year as the holiday approaches, I ask her to share a traditional Mexican recipe with me. 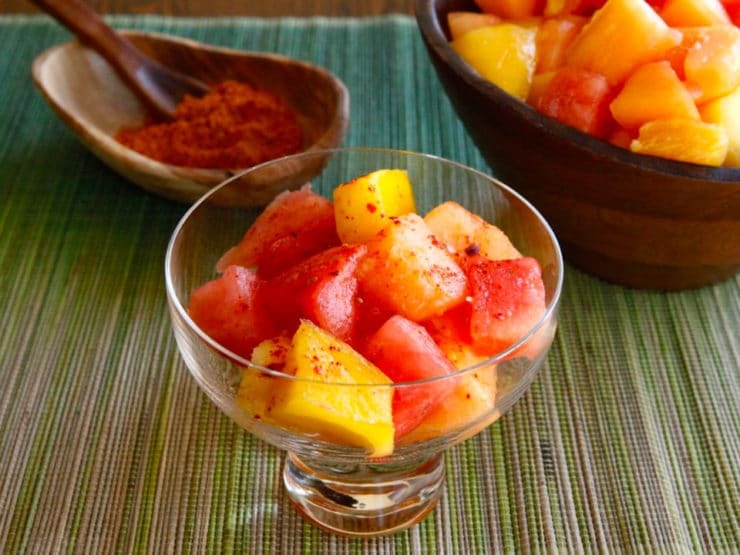 This year she shared her Ensalada de Frutas con Chile – Mexican fruit salad with chile pepper powder. The idea of a spicy, salty, lemony fruit salad intrigued me. 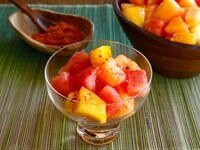 I asked Sandra why she adds spicy chile powder to a sweet fruit salad. “In Mexico we put chile on everything,” she said with a smile. Chile peppers arrived in Mexico from Peru many centuries ago. They are considered a staple item in traditional Mexican cuisine, a part of the country’s cultural and culinary identity. The majority of traditional Mexican recipes contain some type of chile or chile powder. Chile peppers are not always used to add heat; they are valued for their unique flavor that can enhance both sweet and savory foods. Early European reports of the Americas mention chile peppers being added to everything from soups and vegetables to meat and beverages. The strong, spicy flavors were almost intolerable to the European palate, but it was noted that over time the taste became more and more pleasant. Today, many Americans have become accustomed to the spicy flavor of chile peppers in large part due to the influence of Mexican cuisine. This fruit salad is simple, sweet and unexpected. The blend of sweet, salty, tart and spicy is surprisingly addicting. We used watermelon, cantaloupe, pineapple, orange and mango, but you can add a variety of other fruits and even cucumber or jicama in the mix. The preparation contains no added sugar, but when made with fruit is sweet enough to serve as a light dessert. The chile, lemon and salt give it a savory depth, making it a nice side dish for a Mexican-style buffet. Careful when adding the chile powder, it is ultra spicy… start with a little sprinkle, then add more as you grow accustomed to the heat. 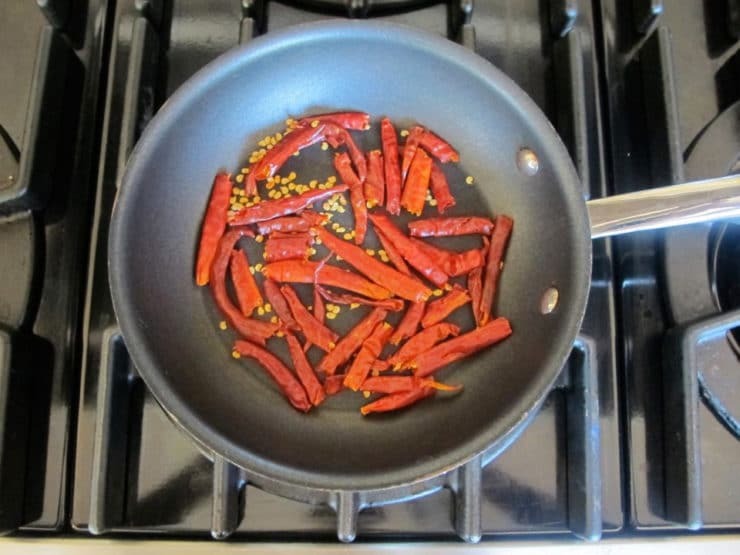 Toast the dried chile de árbol peppers in a skillet over medium heat for about 5 minutes till fragrant and toasted-- the seeds should turn golden. Careful not to let the chili toast too much or burn. 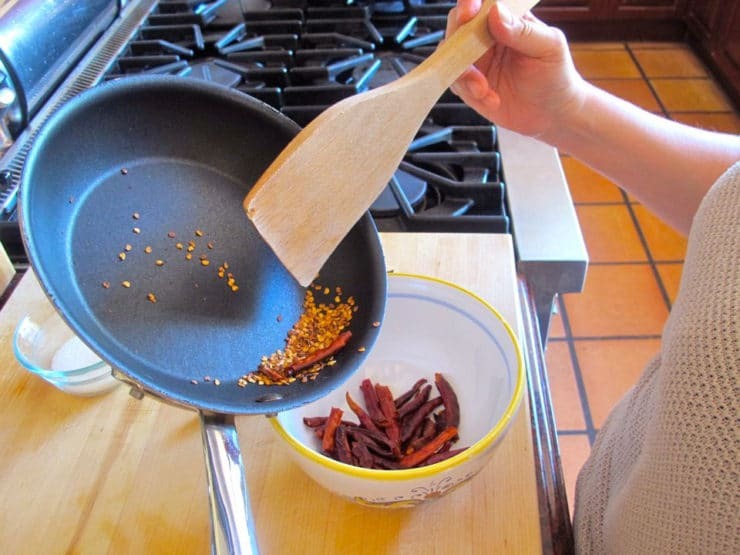 Take the toasted chile peppers out of the skillet, leaving the loose seeds behind to discard. Combine the toasted peppers and 1 tsp salt, then make the toasted chiles into powder. 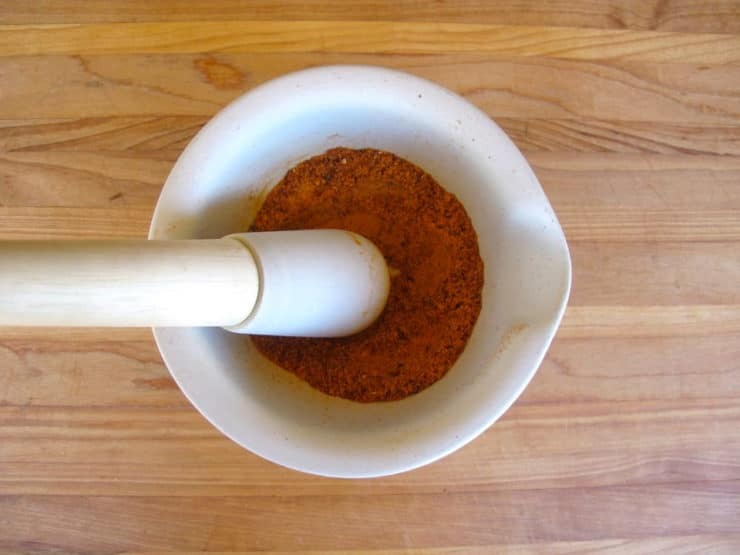 You can use a mortar and pestle to grind the chiles and salt to a powder-- this will take 10 minutes or so and a lot of elbow grease. Or, you can grind the peppers and salt together in a spice grinder. Either way, be careful not to inhale the powder-- it's really spicy and will make your nose burn! Also don't touch your eyes while working with the chiles and chile powder. 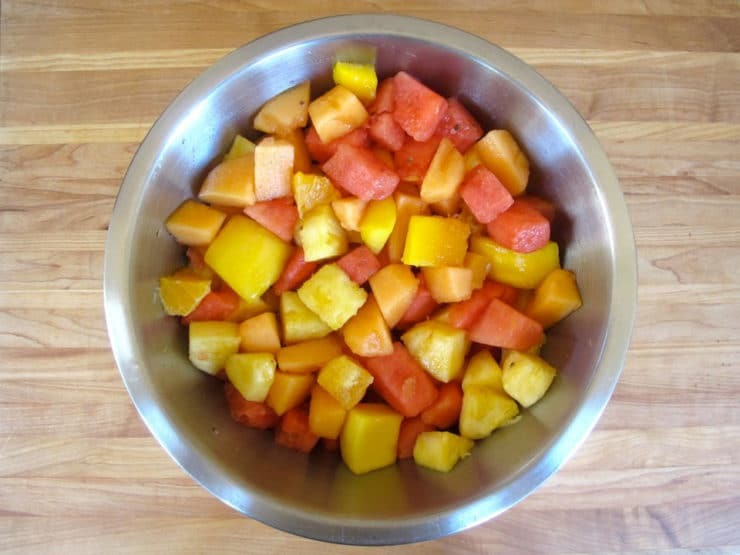 In a salad bowl, toss the cubed fruit with fresh lemon juice and 1/2 tsp salt. Add additional salt or lemon juice to taste, if desired. Can you add strawberry and cucumber to this? The red chilli powder is available in Indian, Pakistani, Srilankan grocery shops. No need to take extra effort to make it. Hi Tori! This looks delicious! My husband is from Sri Lanka and they make a similar salad with pineapple and chilli flakes there: they call it “achcharu”. You inspired me to add some coconut and mango to our next one! Have a nice weekend! Some of the stores here sell Mexican products and one of my faves is Mango con Chile. Dried up mango with sugar salt and chile powder. A real taste treat! Love it! I can’t eat my melons w/out it after living in San Antonio TX. When I was in Mexico, I would see lots of children eating green oranges with chili powder on them…. 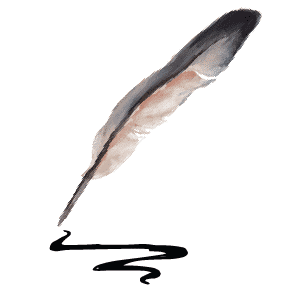 I never tried it…. luv luv luv!!! except I use different fruits in place of melons (allergy). it may sound crazy, but I also sprinkle it on cottage cheese and add a bit of a zing in smoothies. try it on bagels with cream cheese and lox my late husband taught me that. Yo quiero uno, que rico! Melon with dried ginger, is great! Sounds yummy! I’ll have to try it. I used to work in a predominantly Mexican neighborhood. My students would bring mangoes and cucumbers covered in hot pepper powder for snack. I learned to love it just as well. It offers an amazing flavor contrast. You can buy it on every street corner (even in the Valero stations) here in south Texas! It’s so funny how this is caught on. Seriously growing up people thought we were weird adding some juice of a fresh lime, chile powder and salt to our fruit. Just wondering if you can substitute chili powder as I have no place to buy real chilis. Hi Judi, many varieties of chili powder are quite mild, they won’t give you the punch of spicy flavor that chile de arbol will. Try to find a spicy chili powder and mix it with a little salt, or you can mix together some mild chili powder with a little cayenne pepper powder (which is super duper spicy- try 4 parts chili powder to 1 part cayenne) and salt. A chili blend like Tajin would also work well here. Hope that helps! If there’s a Mexican grocery store in your area, look for a bottle of Tajín seasoning; it’s what the street vendors use when they make this. Yup. Tried this on the streets of LA years ago. Love it. Im baking the poppy cake. For my israeli boyfriend. 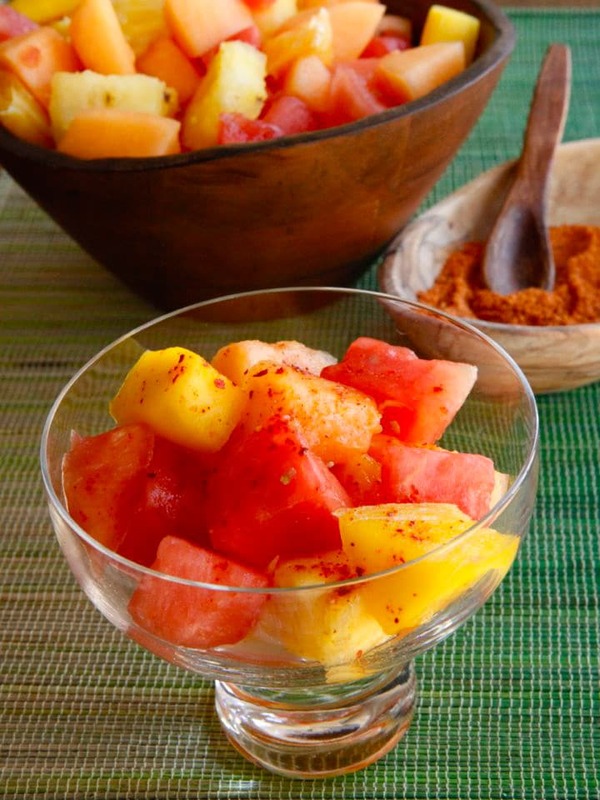 Reminds me of my childhood….lime and chile also good on cucumber, jicama, cantaloupe, and watermelon! Yum!!! One of my favorite street treats in Mexico! Ice-cold sweet mango on a stick, peeled in front of you, a generous squeeze of fresh lime over it all and a dusting of Tajin – as much or as little as you like. Yum.